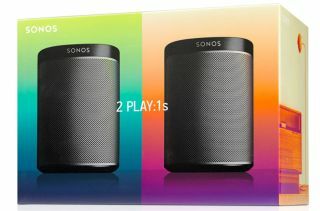 Sonos deal: two Play:1 speakers for £299 | What Hi-Fi? Sonos has launched a '2 Room Starter Set' bundle offering two Play:1 wireless speakers for £299. The Play:1 went on sale for £170 back in October 2013, though the latest Play:1 prices show it's available for a few pounds less, but now you can save a little more if you buy two at once. The Sonos website is selling a pair of Play:1 speakers for £299 - called the 2 Room Starter Set - giving you a tidy saving of £40. Sonos says the offer is "while stocks last". You can of course use individual Sonos speakers in different rooms to make your multi-room system, but you can also have two Play:1 speakers as a stereo pair (as you can with the Play:3 and Play:5). However you choose to use them, if you were thinking of taking the plunge on a couple of Play:1 speakers, now seems as good a time as any. Head on over to the Sonos website for more details.